A law passed by the Legislature in 2016 exempted private renewable energy generation facilities from certain laws that regulate electricity generating facilities. LB1054, introduced by Gordon Sen. Tom Brewer, would remove wind energy from the list of facilities exempted. 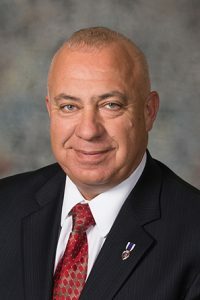 Brewer said the Legislature “took away the voice of the people” when it exempted wind energy from the Nebraska Power Review Board approval process. LB1054 would place wind energy back under the board’s scrutiny, he said, because the current process of approval by county governing bodies is not working. Many county board members benefit financially from investment in the wind industry, Brewer said, and consequently are unable to be unbiased and objective when deciding whether to approve wind projects. John Stanner of Brainard testified in support of the bill, saying the state’s public power system ensures that suppliers only build when facilities are needed so as not to raise rates for consumers. Private wind projects should have to abide by the same power review board process in order to determine whether their projects benefit Nebraskans, he said. “The 2016 exemption for renewables created a situation where a private entity can build an energy-creating facility without regard for the impact on rate payers,” Stanner said. Also testifying in support, Keith May of the Holt County Planning and Zoning Board said wind energy companies target areas in rural America where zoning regulations are weak or nonexistent. Companies befriend elected officials and recruit landowners, he said, ensuring favorable outcomes for their proposals. This was the case in Holt County, he said. “Attempts by the zoning board to revise the current regulations have been met with opposition from wind companies and our own [county] supervisors,” May said. Thomas Budler of BHE Wind, a subsidiary of Berkshire Hathaway Energy Company, testified in opposition to the bill. The company has completed a 400 megawatt wind farm in Holt County, he said, which is the largest wind energy facility in Nebraska history and is a $600 million investment in the state’s economy. Budler said the regulatory regime in place before 2016 put the state at a competitive disadvantage in attracting wind energy projects. Restoring those barriers would discourage future development, he said. 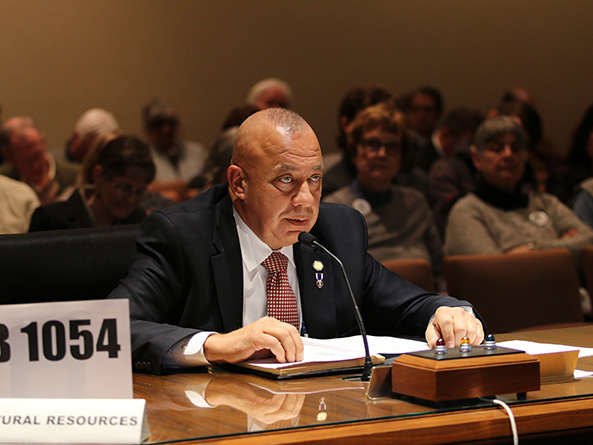 “Investment decisions must be made today and the uncertainty that LB1054 would impose … creates a significant cloud over investing in Nebraska,” he said. Also testifying in opposition was Chelsea Johnson of the Nebraska League of Conservation Voters. Counties currently have a process for determining whether or not to allow wind energy projects, she said, and the state should not restore the additional hurdle of approval by the power review board. “We have a public process for these projects in Nebraska, and we have examples of that process yielding varying results for wind projects depending on the overall needs and desires of local communities,” Johnson said. The committee took no immediate action on LB1054.